Thank God for bookstores. 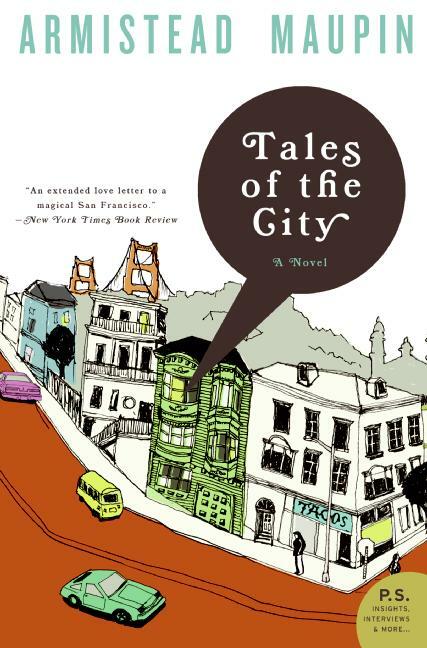 When I was browsing Books Inc on Haight Street, I came across Armistead Maupin’s Tales of the City on a wall of employee recommendations. I’d heard of both the book and the author. I know it was popular and turned into a TV show. I figured it was time to read it. I had low expectations, hence I ended up loving it. This is required reading for San Francisco dwellers. It’s very San Francisco, meaning there are numerous SF references: the Bohemian Club, the Grove, Sutro Baths, the University Club, Beach Blanket Babylon, 450 Sutter medical building, Wilkes Bashford. So fun to follow along as the characters run around the city and the Bay Area. Tales of the City appeared as a serial segment in the SF Chronicle. The writing is very Dickensian, like a soap opera. It’s not quality writing, but the plot’s good and the characters are memorable. I can see why it garnered a cult following. Maupin went on to write a whole series of novels based on these characters. Can’t say I’d read more of the series, but glad I finally got to read this pop-culture classic.